On Friday, November 19, 2010 the eighth grade class was buzzing with excitement. If you saw them you would have witnessed them practically floating through the halls. This was their big day. They received their class rings. At the conclusion of the Divine Liturgy Father Ivan blessed their rings in a beautiful ceremony. 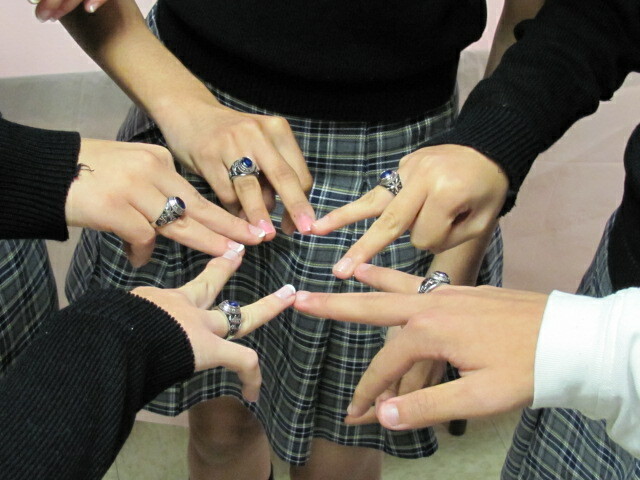 The students were told about the significance of the ring and how it should always remind them of their days here at ACS. Each student then came forward to Father Ivan and received their rings. Father Paul Makar was also part of this special day. Students were happy to be the first to receive their rings from Father Ivan. They were also happy to have two priests for their ceremony. After students received their rings, they had their pictures taken with both priests, their principal, Mr. S. and their teacher, Mrs. Pickering. They then took their families to the Church hall for a small celebration. More pictures were taken and rings were turned. The turning of the rings is a tradition in which the students have others give one complete turn to their rings until they reach the year of their graduation. For this year’s class it would be 111 because the class of 1999 turned theirs 99 times. The Class of 2011 has lived up to their responsibility of being good role models for the rest of the school. The entire ACS family congratulates them and hopes they enjoy the rest of their days here at ACS.